Low Costs. Rapid Testing. Right-Sized Processes. Why work with a New Space firm? As a major Prime, why not just build it yourself? New Space firms won’t have access to the equipment you do. New Space firms won’t have as diverse of a workforce as you do. ULA had reasons for working with New Space. Lower Costs: “performance and reliability our customers need at a more affordable price.” The overhead/G&A cost burdens for large companies often makes one hour of effort for a smaller company cost less than at larger aerospace firms - even when you factor in the smaller firm's profit margins. Faster to Test and Re-test: “rapid turnaround for build and test cycles that drive innovative learning.” A culture built on the idea of “when in doubt, build” rather than a culture built on “when in doubt, PowerPoint”. Right-sized Processes: “small company project management approach.” Larger companies often times have a one-size-fits-all set of processes that may work well for large development efforts but may need to be rethought for smaller, more risk-tolerant efforts. Kudos for ULA/XCOR recognizing the need to match the processes with the effort. Every industry is replete with examples of large firms working with/buying innovative smaller firms to gain the advantages mentioned above: lower costs, rapid testing, right-sized processes. But first you need to get invited to the dance. New space firms need to demonstrate enough independent success to get noticed by these larger companies. But how do you demonstrate that type of independent success? Lower costs. Rapid testing. Right-sized processes. Congrats, XCOR. 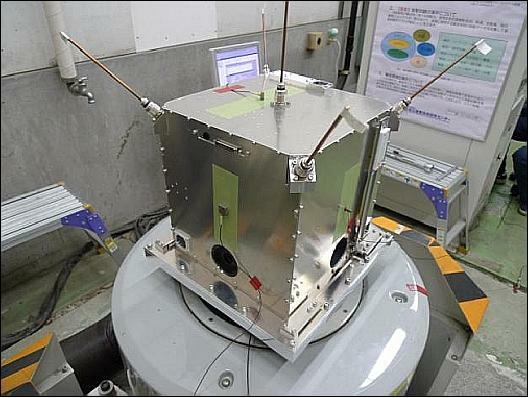 The 2nd Nano Satellite Symposium is being held today at the University of Tokyo, Japan. Evidently the Tsunami has shortened the event from three days to one day. At the conference, AxelSpace and Symposium organizers announced sixty entries in a NanoSatellite Mission Idea contest. Symposium organizers list the top 32 entries (and a mission abstract). These top 32 entries come from 22 different countries signaling (or at least hinting at) strong international demand for a NanoSat launch capability. Time to Raise Money for a Space Startup? 8 Questions to Help Decide if You Should be Raising Money Now. Below are Mark’s eight questions with my commentary intermixed. Note, Mark is a Silicon Valley investor so many of his examples are focused in that area – still a lot to glean for New Space. 1. Are you in the “lean” phase? Are you trying to figure out if your idea is an incremental improvement or a game-changer – if so, keep your capital needs small. Once you have proven (even if just to yourself) the world-changing worthiness of your idea than gather some investment money and ramp up capital use. When seeking seed funding – usually look for $500K to $1M initially from outside investors. 2. How much capital do I need to run my business effectively right now? A good rule of thumb: an entrepreneur needs capital for 18 months of operations. I appreciated this nugget. As an entrepreneur, eighteen months feels like an eternity, but I should be striving for this! 3. How much dilution am I going to have to take now? An investor offers The founder of Acme Rockets a pre-money valuation of $2M for a $1M investment in Acme Rockets. Should Acme Rockets agree? Before the investment Acme Rockets owned 100% of company. If they accept the investment terms, the Acme Rockets founder’s ownership percentage will be diluted to 67%, a 33 percentage point reduction. Worth it? Maybe. How about a $2M investment at $2M pre-money? 50% dilution in a single round. Probably not. 4. How many more rounds of capital will I need & what is my expected total future dilution? Here is the spreadsheet (containing the table above) where I provide an interactive example of Founder Dilution with each Round of additional Investment (overly simplistic to make the point). Fun to play with. 5. What things could I do with capital today that might improve my market positioning? I hear the argument which goes – wait to raise capital until you can get a more favorable valuation. For New Space companies like Acme Rockets, this means winning government contracts, building demos, increasing customers for an NLV upper stage which is not yet built – anything to mature their technology. But there is an opportunity cost in waiting. 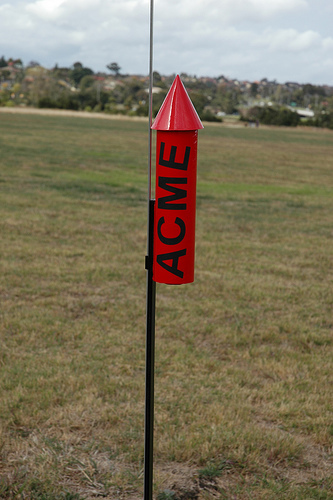 What could Acme Rockets do now with $1M dollars to grow their company? This is “make-the-pie-bigger-and-don’t-care-so-much-about-your-slice-of-it” argument. 6. What things might competitors do if I don’t raise capital that might impact me in the interim period? The biggest nugget in this section was the psychological effect investors feel if another firm in an industry announces a large funding round. Who wants to invest in NLV upper stages from Acme Rockets after its competitor just took the oxygen out of the room by announcing a $10M investment to build a similar NLV upper stage? Raise capital so your competitor can’t – I agree with this in the short term, but I would rather focus on wowing customers than fearing competitors. 7. What might future markets hold in terms of valuations? Try raising money right after September 11, 2001. When is the next market dip? 8. What might future markets hold in terms of ability to raise capital? Mark ends by reminding us that 8 Questions to ask are nice, but don’t over think this, sometimes you take the deal because the money is available…and might not be tomorrow. Thanks Mark for a great 8-Question post. Worth reading it in Mark's words over at Both Sides of the Table. Space Entrepreneurs, I hope it helps. In October of 2004, I attended the Space Frontier Foundation’s conference in Southern California on the Queen Mary. There, Masten Space Systems made a big splash announcing it was joining Armadillo Aerospace in developing Suborbital RLV’s. I remember thinking at the time, how did Masten have enough market data to make that decision? Masten, Armadillo, XCOR, Virgin, Blue Origin – these guys & gals threw their hat in the ring long before there were significant studies confirming suborbital RLV’s made “market sense”. They had vision. They had guts. Or if the data did exist, at the time, I did not know how to find it. And now, NASA is offering a prize for a Nano-satellite Launch Vehicle (NLV) – “launching very small things quite often”. 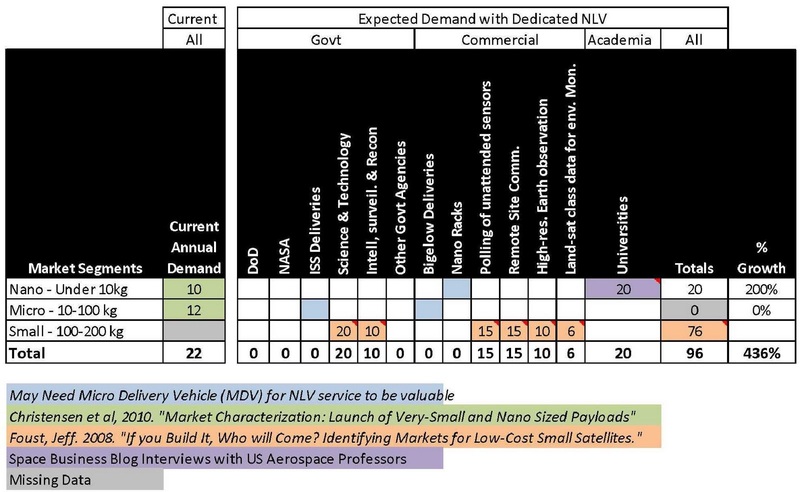 And as candidate NLV teams consider throwing their hats in this ring, the market data is a little more available for an NLV service than there was for suborbital service almost a decade ago. This post attempts to consolidate that NLV market analysis. Of course this will be incomplete, so I need your help. Add links to other NLV market data in the comments of this post to benefit the whole group. I will skip a discussion of NASA's NLV Challenge. Here is NASA's NLV Challenge Page for more details. NLV Market Sources. The authors of these study deserve your business. Buy their papers. They are doing good work. Instead of at the end of this post, I wanted these links near the top! Christensen, I, et al. 2010. 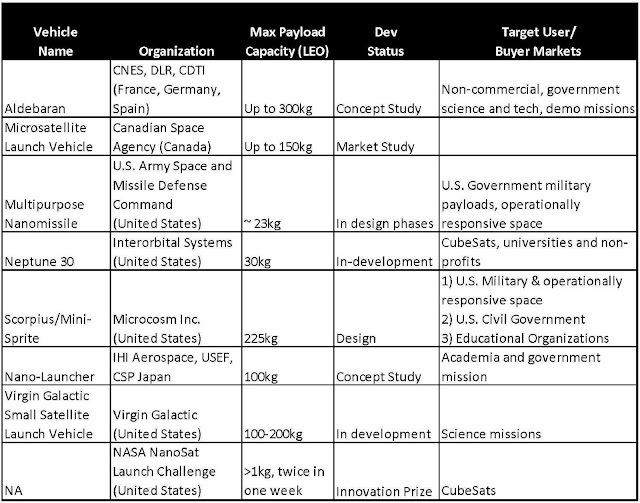 “Market Characterization: Launch of Very-Small and Nano Sized Payloads Enabled By New Launch Vehicles.” This link will give you the first few pages, have to buy the full version. Market Overview. 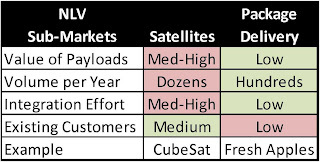 The NLV market can be dissected in at least two ways: (1) by payload size and (2) by payload type. Payload Size. I have heard various naming conventions for small payload launch vehicles. For this blog post, I will use “Nano”, “Micro”, “Small” as three payload sizes to consider. However, I will group them all together and use the name NLV most of the time. NASA is focused on a 1kg payload for its NLV Challenge. The Army is interested in at least 20kg payloads. Even if first generation vehicles are only able to launch a few kg of payload, commercial NLV ventures would be wise to endeavor to grow to larger payload sizes over time. Current 200-400kg payloads launched currently on larger vehicles would surely be interested in "going on a diet" if an NLV launcher could carry 100-200Kg yet offer more frequent launches. Payload Type. The second NLV market subdivision will be the option of (1) launching a functioning satellite or (2) delivering cargo to stations or depots. Of the two, cargo delivery may very well be the larger of the two sub-markets. It will take far less preparation to send the ISS an NLV-load of fresh apples than it would be to fund, develop, integrate, and launch a nanosat. Both satellite launches and cargo delivery will be sub-markets. Expect the satellite market to retain a diversified customer base. Expect the cargo delivery customer base to be dominated by station owners in the early days (ISS partners and Bigelow), but to expand to Space Station customers in the not so distant future (see: NanoRacks). NLV Market Differentiators. What makes an NLV unique? An NLV won’t be able to carry as much payload to orbit as its bigger cousins, why would any customers want to use an NLV? Answer: Frequent launches, low integration time. Suborbit/LEO/GEO: Limited to LEO (at first) – Suborbital applications? Maybe. Launch as secondary payload. Spaceflight Services (Andrews Space) offers a turnkey solution for your payload to fly on the BIG rockets as a secondary payload. Commercial RLV suborbital spaceflight. Masten, Armadillo, and Blue Origin are stuck at 100km for now, but not for long. Watch as future generations of their vehicles climb higher and higher giving customers a greater flight-time, frequent launches, and very low costs. With COTS deliveries to ISS approaching, deliveries to station will be made by NASA several times per year with ISS partners also delivering cargo to station several times per year. Potential Market Competitors. 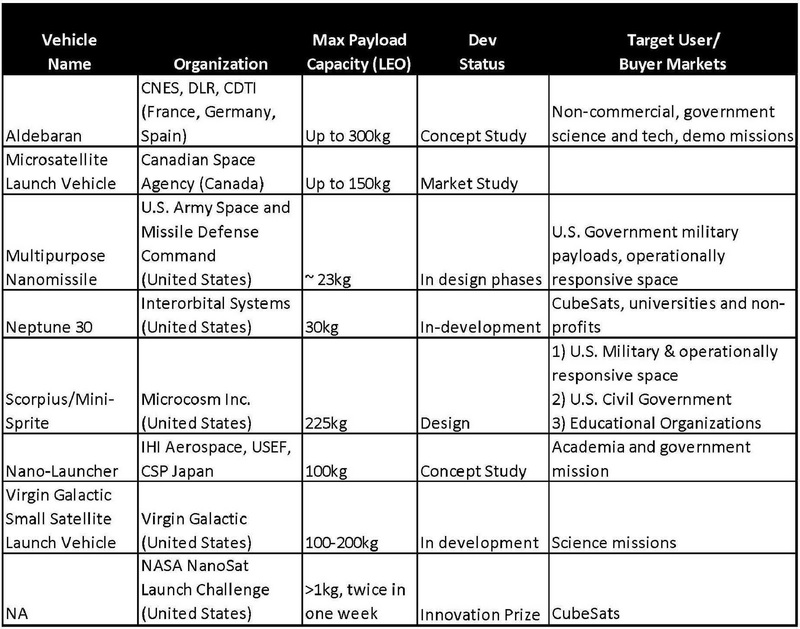 Non-exhaustive – From the Paper: "Market Characterization: Launch of Very-Small and Nano Sized Payloads" by Christsensen, et all. 2010. This graph is incomplete but should convey the significant number of different areas where an NLV could gain market share. For an explanation of these categories I would encourage you to get a copy of the wonderful papers I list under the “sources” section of this post. NLV Pricing Discussion. A major portion of any market analysis is not just what the needs are but what are potential customers willing to pay to meet those needs. For the NLV market you have customers at different ends of a spectrum. Government customers like the Army have stated a willingness to pay $1M to place 20kg in LEO. Universities want to keep Cubesat costs (usually 1-3 kg) to under $20K per U. Variable Pricing seems like the right answer, where Primary customers pay a premium to fly on their schedule to their orbit and others willing to fly “standby” get a much reduced price but operate on someone else’s schedule and flies to someone else’s orbit. Rather than rewrite the variable pricing details now, here is the post I wrote on variable NLV pricing a few months ago. Of all of the substitutes available to the NLV market, the one that has most potential to steal market share is the second or third generation of suborbital RLV’s. As mentioned earlier in this post, a subset of the NLV market could be served with the extended micro-gravity offered by suborbital RLV’s flying to 500 or 1000 km. But the opposite is also true, a delay or accident affecting the un-manned portion of the suborbital RLV industry (primarily Masten, Armadillo, and Blue Origin) could make some customers consider launching on an NLV rather than waiting for the suborbital ride. How the last mile problem gets solved will directly affect the viability of micro package delivery (one of my two submarkets). We need solutions for the last mile problem – the solution will be part technology, part policy, part management. 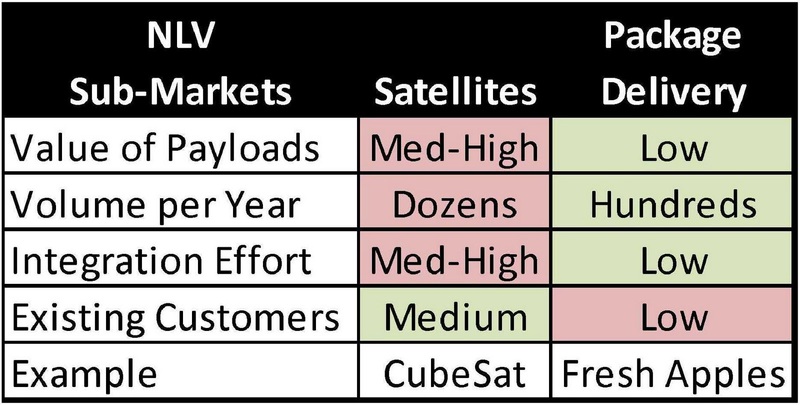 If NLV packages can’t be routinely delivered to space stations, the NLV industry will be severely hampered and space stations will miss out on an enabling method to gain just-in-time deliveries. Although depot development is still years down the road, the potential “match made in heaven” between depots need for frequent propellant deliveries and NLV’s ability to fly frequently should not be overlooked…but I would not build a business plan around depot assumptions just yet. That is a good dataset to start. I will add some commentary in future posts. Here is the spreadsheet containing the tables used in this post. Now I welcome your additions. Use the comments section to your links to even more NLV market data. The GCT is offering five to ten awards up to $5M per year with no individual award valued at more than $3M over three years ($1M per year max?). 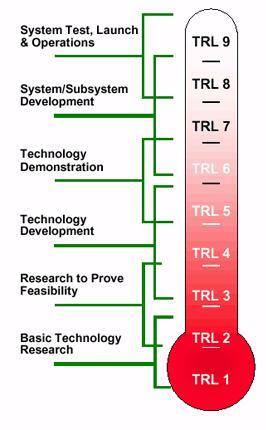 GCT is looking for technologies at a TRL of 3-4 and wants to mature them to a TRL of 5-6. One of the challenges facing a new company with an idea is how to fund development of that idea. Seeking external capital too early usually results in interested investors taking a sizeable chunk of ownership for a relatively small investment since the company valuation is so low. And in many cases, these companies don’t even find interested investors. NASA’s GCT is offering an alternative method to jump start development to bring these innovations to market faster. "This solicitation is focused upon these types of sudden and unexpected innovations that hold a potential for providing a “game changing” impact on the efficiency and effectiveness of space capability"
Speaking of the DARPA-like proposal process, “NASA expects this process to prevent unproductive proposal preparation for technology concepts that are unsuitable for unsuitable under this particular BAA"
"While other technology development activities seek the steady and deliberate evolution of well-understood systems, GCT focuses on developing radically new approaches to the Agency’s future space missions and the nation’s significant aerospace needs. Successful products of GCT will provide or lead to revolutionary advances in capability." "Appropriateness for GCT: Does the proposed technology or concept have the potential to make radical improvement s in the way NASA accomplishes its missions?" And all along the way GCT is offering feedback and improvements. All you need right now is a “game changing” innovation and an executive summary. Let’s get to work.